There is nothing more wonderful than Spring's first lilacs. Except maybe sharing them with the babies for the first time. Beautiful...such a stunning scene you have created, and yet so simple. And what a joy to share the would world with your sweet little ones. It's like discovering it all over again for the first time, yes? Beautiful - one of my spring favorites. Your "conversation" reminded me of when my two were babies and our walks through the garden, pointing and identifying. Now at 3 and 5, they're helping me with spring planting. The time goes so fast. Glorious, the look the scent. Spring has arrived! I agree, just beautiful! Have a wonderful weekend! They are just beautiful, I love how you have arranged them in the vase! I can almost smell them! Beautiful! I am thinking we will be needed some lilacs next year!! I can smell them from over the pond! Gorgeous - and I just love their smell. Goodness those are gorgeous! I don't believe they grow here. I so wish they did!! Everything is made a little bit more beautiful when it's shared for the first time with little ones! Oh these are simply beautiful!! Lilacs are not only pretty to look at but smell oh so wonderful!! It's so true. Ours however, took so long to bloom, but were finished in only a couple days! I was actually kind of dissapointed. There is so much anticipation, and then just a few fleeting moments of enjoying their sweet fragrance. You're looks beautiful. I just LOVE your florals... every time! Absolutely. I couldn't agree more!!! I just took my babe for a lilac stroll and ended up filling the whole stroller with them. Happy Spring! Beautiful. Such a lovely flower. Thank you for sharing your lovely lilacs. Mine are just now leafing out and I am so looking forward to the flowers. 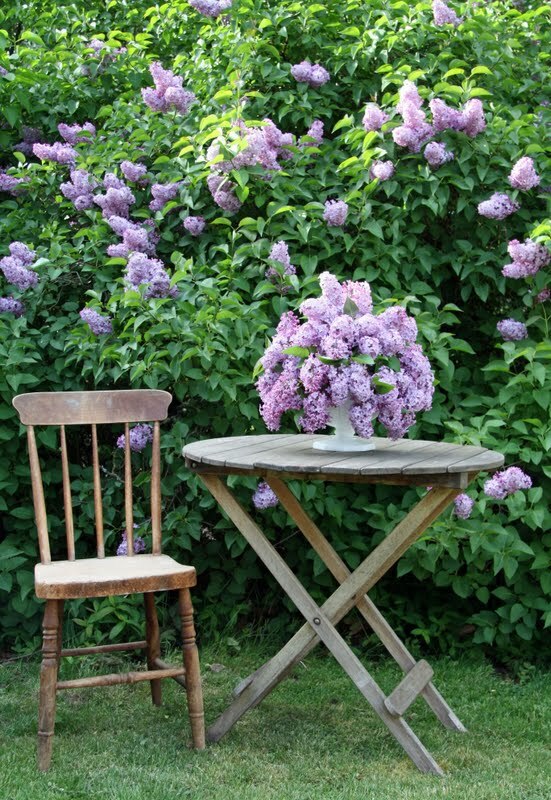 On our property we were blessed with an old lilac bush and the scent of them is magnificent! 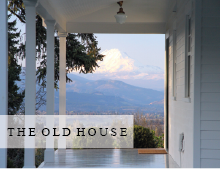 Wishing I could join you on your lovely porch for a coffe and a chat. Unbelievable. I can just imagine the fragrance in the air! I can smell them all the way down here in Houston. So pretty!! So beautiful! I see four little hands picking those in the future to bring to mommy! They are gorgeous and your pictures beautiful! How fun to see things afresh through baby eyes. This is absolutely one of the most beautiful images of lilacs I've ever seen! 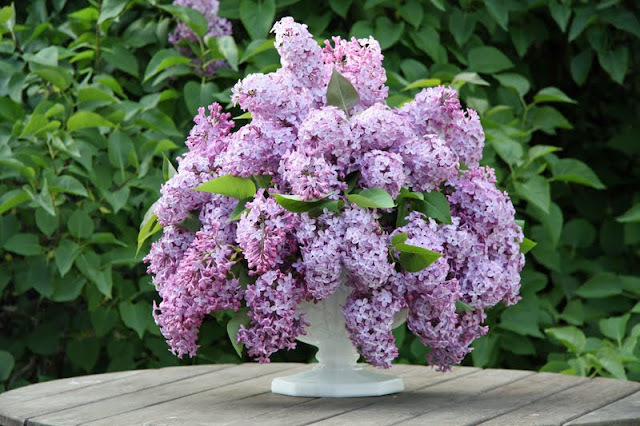 What a stunning bowl of lilacs - the prettiest I have seen anywhere else on blogdom. I have never lived anywhere where lilacs grew and I have always admired them and wondered about that heavenly scent. Lilacs are one of the few things that don't grow well in the Bay Area --- yours are a treat to see! Fabulous. I just love lilacs and they are so hard to grow in California. I would love to have a big lilac bush like that. The bouquet is gorgeous. Beautiful! Thanks for sharing them! Oh my...this bouquet is even more lush than last years...just beatiful!! I wonder if the babies can smell them...I'm sure they loved seeing them, what a special experience...lilacs for the first time! They are spectacular...can almost smell their glorious scent!! Wow - that's some amazing bunch of lilacs and oh so beautifully presented in that heavenly milk glass urn. You just have the touch! Thanks for sharing such spring prettiness. Mother Nature never disappoints and nor do you. They are gorgeous! I'm planning to plant some lilacs in my yard and I can only hope they will be as beautiful as yours. Happy Spring! absolutely beautiful!!! Such perfect prettiness to wake up to this morning with my coffee! Such fortunate babies they are... I'm sure they will grow to love the lilacs as much as you (and I) do. Your photos are always filled with such splendor and your posts with such happiness and appreciation. Thank you. I just found your blog through Hidden Sisters. I am so happy to find you and am your newest Follower. I love the photos of the various rooms in your home. Hi Trina - how beautiful!!! Ours are just beginning to flower. Cannot wait. These are so beautiful flowers. Lavender colour is best colour in flowers, Such a gorgeous. stunning photos! 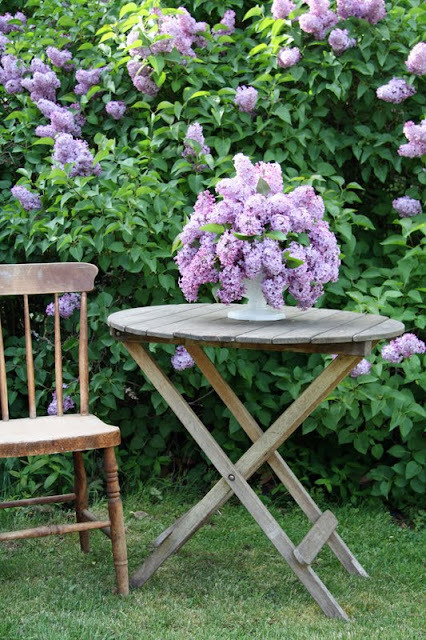 I love the scent of lilacs....and the colours.....and how they fall over and fill a vase! so romantic! thanks for sharing! Such pretty photos! It is lilac season in N. MI too and my house is filled with fresh white and purple lilacs and smells wonderful. I tried taking some pictures with my baby but all she did was try to put the flowers in her mouth. Too cute. I'm your newest follower! Very pretty blog!